This is a great event that is sure will touch your heart as we partner with Niswonger Children's Hospital on their Scarecrow Skeddadle. 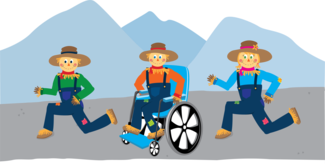 This event is open to all ages but geared towards children including a Modified Race (those who require use of hand-held assistance, walkers, wheelchairs, power chairs and personal coaches. Come join us.